Liverpool endured yet another goalless draw in the Premier League this season after a frustrating clash against Merseyside rivals Everton on Sunday ended in a stalemate. The result further dents Liverpool's title-winning hopes, as Manchester City established a 1-0 win over Bournemouth on Saturday to sit one point clear at the top of the table. Despite finding a comparatively easy opponent in Fulham, Liverpool still have to face third-placed Tottenham Hotspur in what will be a decisive clash at the end of March. After the game, Liverpool boss Jurgen Klopp gave an all-too-familiar reason to justify his side's failure to secure three points. Speaking to Sky Sports, the manager said, "Very, very difficult game for different reasons. A wild opponent and - I know people don't like it when I say this - the wind came from all different directions, you saw that in a lot of situations." It may be recalled that the former Borussia Dortmund boss had a similar reason for Liverpool's FA Cup defeat at the hands of the Wolverhampton Wanderers in January. 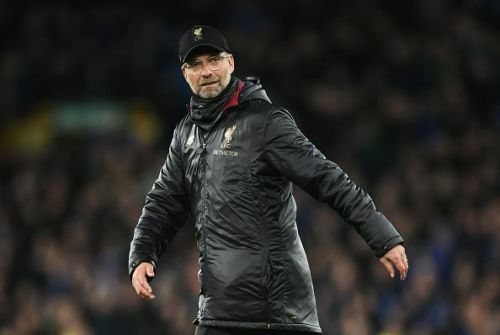 Besides the wind, Klopp had previously blamed the length and dryness of the grass on the pitch, and even TV broadcasters whenever his side showcases below-par performances this season. If you’re dumb enough to believe #Klopp really thinks the wind was the reason behind our failure today, you really shouldn’t follow football. Jurgen Klopp:Liverpool found it difficult to control the game, and that the wind played a part in the match. Does Klopp realize football is an outdoor sport? #Klopp saying the wind played a part in #liverpool not getting the result today.. I don't think even Wenger used the wind as an excuse for a poor result and he was the king of excuses.